I love ice-cream. LOVE it. I received an ice-cream maker for my birthday this past summer, and it has gotten a lot of use since then. Looking back, I also should have purchased shares in a dairy company. The consumption of cream has risen in this house exponentially since receiving this gift. As I noted in my post for Gingersnap Maple Pecan Ice Cream, I have to continue to implement my rule whereby I only consume ice-cream in the presence of other adults. Otherwise I would sit in my basement watching daytime tv and eating ice-cream while my kids fend for themselves upstairs. I've been brainstorming since the summer about this ice-cream. Tiger-ice cream has been a favorite of mine since I was a kid. It's becoming more popular again, as I see it occasionally in the grocery store now. I feel there was a period of time where it was extinct. It was hard to find, and it made it even more of a treat. 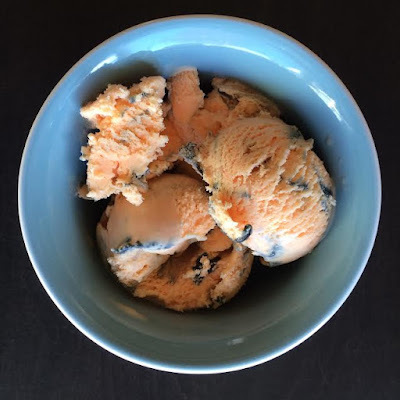 In case this first-world problem rears its ugly head again, and there is a shortage of Tiger ice-cream throughout the land, I have discovered a solid solution....this recipe! On a side-note, in case you don't know what Tiger ice-cream is, I'm sorry that you haven't experienced this. Take a read here, and check out this little blurb about it. It's basically orange ice cream with black licorice swirls throughout. And it's mind-blowing. I hesitated to try this for quite some time because I wasn't sure you could really duplicate the delicious syrupy licorice goodness at home. I searched through different syrup and caramel recipes to see if I could adapt them to be licorice. Then one day, while I was vacuuming (yup, some of my best ideas come when I'm sweating it up with housework), it came to me. Why was I reinventing the wheel? Why couldn't I just start with a white corn syrup base and add to it? Why was I trying to be a hero and make my own syrup? Throw this in your ice-cream maker and prepare to be amazed! Also clear your schedule for additional gym time. Sorry. Whisk together the creams, sugar, orange extract and food coloring (you will only use a very small amount on the end of a toothpick). Use enough to achieve your desired color shade. Pour into a 2 quart ice-cream maker and process according to manufacturer's directions. While your ice-cream is spinning away, stir together the corn syrup, anise extract and black food paste in a small bowl. Place in the refrigerator until ready to use. This will really thicken up your corn syrup and make it easier to handle when swirling. Once your ice-cream is finished (mine takes about 30 minutes), turn off your ice cream maker and get ready to swirl. I think hand swirling is optimal because then you can really control how much and where it will be. I thought about just dumping it in my machine in the last minute of processing, but I was worried it would "mix in" too much. Start by putting one third of your finished ice-cream in an airtight container (you will need about a 1.5 quart container). Drizzle 1/3 of the syrup over-top of this ice-cream layer. Add the next third of the orange ice-cream to the container. Repeat syrup drizzling. Add the last layer of ice-cream and finish drizzling with the last of the syrup. Now, take a butter knife and "cut" through the ice-cream in random swirling motions to swirl the syrup more through each layer. Place the ice-cream in your freezer for four to six hours to fully firm up. Scoop and enjoy!